Tuesday night, CNN host Don Lemon gave former Donald Trump campaign manager Corey Lewandowski a lesson in black history as well as some stern advice for his boss when it comes to speaking to black voters. Later, after Lewandowski attempted to deflect from Trump’s racism by saying he has African-Americans working for him, Lemon took the former campaign manager — along with his boss — to the woodshed. How bad is the Chumph loathed? KKK Leader David Duke has more support among black folks. The Republican nominee is no David Duke—since at least David Duke says what he means, while Trump just dog whistles. There is almost no group left that Donald Trump hasn’t offended: Muslims, babies,women, Gold Star families, and of course Hispanics. Yet there is one group that despises Donald Trump more than any other: black Americans. At an average of just 2 percent support in the polls, Trump is running fourth among black voters, as Harry Enten noted last week. He’s 84 points behind Hillary Clinton, but also trailing Libertarian Gary Johnson and Green Jill Stein. The findings of recent surveys read like an Onion headline or possibly a “Saturday Night Live” sketch left on the cutting room floor: “Former Ku Klux Klan leader David Duke has more black voter support than Donald Trump.” Just think about that for a second. A white guy who was actually a leader of an organization synonymous with not only hating, but terrorizing, black people is more popular with black people than a white guy who used to host a reality show and now may become president. Trump’s insanely offensive rhetoric against other groups has drawn extensive media coverage and denunciations from people from both sides of the aisle. His allegations of bias against federal judge Gonzalo Curiel were called the textbook definition of racism by Republican House Speaker Paul Ryan, among many, many others. His early calls to ban the entry of Muslims to this country have been so widely denounced it’s hard to find a public figure –even among those who have endorsed him—who has not come out against the remarks. He’s made more derogatory comments about women that I can count. While he has certainly had moments that can be perceived as offensive to black Americans, such as when he inaccurately tweeted that black people are responsible for 81% of white homicides (which was nowhere near true), when people think of groups Donald Trump has insulted we’re certainly not at the top of that list. And yet, Trump is polling at 24 percent with Hispanic voters, and still has the support of 35% of women voters. With black Americans though, he is at 1 or 2%, depending on the poll. That rock-bottom number has put traditionally red states with notable pockets of black voters in play for Democratic nominee Hillary Clinton. While black voters tend to be more party loyal than other groups, Mitt Romney still managed to get 6% of the black vote, and that was in an election year in which black voters turning out to reelect our first black president shattered previous historical turnout records and were given much of the credit for Obama’s glide back to the White House. So what is it about the Donald? It’s true that candidate Trump has not singled out black Americans for the same obsessive and insulting focus he has some other groups, but the contempt for him within the black community has been brewing for much longer. For starters, he made himself the face of the “birther” lie against President Obama. He claims credit for pushing the President to release his birth certificate. (Ironic considering the President’s 2008 opponent, Sen. John McCain, really was born outside of the country, as was 2016 contender Sen. Ted Cruz, both of whom have since become Trump foes.) For many black Americans, the entire birther conspiracy was added to the list of indignities no previous commander-in-chief, all of whom were white, had been subjected to. While most birthers until Trump had primarily been seen as basement kooks who occasionally landed airtime on a few cable shows, he lent the movement a mainstream face that many black Americans have not forgotten or forgiven. Additionally, while Trump’s language and policy proposals have perhaps not been as openly hostile to black Americans as some other groups, black people are well acquainted with coded dog whistles – and the impact they can have. For instance, Trump’s false tweet about the level of crimes committed by black Americans against whites is precisely the kind of rhetoric that plays into the worst fears of his overwhelmingly white supporters. He’s been doing this for decades, since he put out full-page ads calling for the death penalty for the five black boys of the Central Park Five (something he’s never apologized for, even after it emerged that those boys, who spend decades behind bars, were innocent). 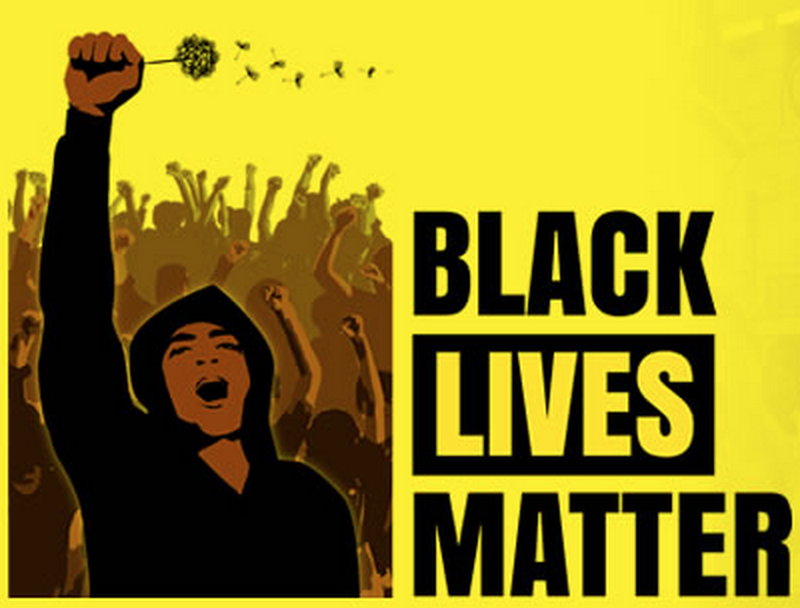 Historically, rhetoric like Trump uses has resulted in terrifying fallout for black people. Many forget that the 1915 film “Birth of a Nation,” is credited with reinvigorating the membership of the Ku Klux Klan, the film’s message essentially that someone needed to take a stand against the rising tide of dangerous brown people. Sound familiar? The era immediately following the film’s release would be one of the most horrifying in terms of violence against black people, men in particular. So when Trump says of a black protester “maybe he should have been roughed up,” and black protesters at his rallies are punched and otherwise assaulted, his candidacy inevitably calls to mind darker days – particularly for black Americans living in an age in which the shootings of unarmed black men by police are not an uncommon occurrence. Duke’s bigotry may be offensive, but at least it’s honest. Trump’s is just plain offensive. How Much to Hispanics and Black Folks Despise the Chumph? Hispanics and Black Folks have taken a real disliking to the Chumpf. I suspect Asians aren’t far behind, as well as Gay people, and women. It turns out antagonizing Americans of every stripe, as Donald Trump has done continually with his bombastic rhetoric, has actual consequences. Yet even more striking is Trump’s standing with people who are black and Latino — growing voting blocks whose support is crucial to cobbling together a winning coalition. A staggering 94 percent of black voters view the real estate mogul negatively, as do 89 percent of Latinos, despite his predictions that he will “win the Hispanic vote” in November. Trump wants to build a wall on the U.S.-Mexico border and deport millions of undocumented immigrants. He’s gone on a racist tirade against a federal judge of Mexican heritage, and his outreach to Latinos entails posing for a picture on Cinco de Mayo with a taco salad bowl. He initially refused to disavow former Ku Klux Klan grand wizard David Duke, before later doing so. And he has significant backing from white supremacists, especially online, where they harass his critics with vile and racist attacks. The reality TV personality has taken the 2012 GOP “autopsy” — a set of recommendations the Republican National Committee released meant to broaden the party to minorities — and completely blown it up. With five months to go until November, and no sign their presumptive nominee is willing to change his approach, it’s difficult to see whether the Republican Party can repair its already low standing with non-white voters. The Manhattan businessman’s only play may be over-performing with whites and independents. Clinton’s unfavorable with 75 percent of white people, 73 percent of whites with no college degree and 63 percent of independent voters, according to the Post/ABC poll. However, current polls show Trump isn’t in a stronger position than Mitt Romney was in 2012 to pull in enough white voters to win. Now, I have problems with Clinton being too far to the right, and having too close ties with the big banks. However I believe she is a savvy enough leader, with a powerful style that she isn’t going to be stupid enough to hamstring her Administration, or Democrat majority Congress with the dumb arsed self defeating “bipartisanship”, and spineless timidity in speaking out about issues. She will take a sharp knife to the sort of BS extremist Republicans have been pulling and getting away with from day 1. After several weeks of polls that showed Hillary Clinton only a few points ahead of Trump, and two that put her lead within the margin of error, Bloomberg on Tuesday released a pollgiving the former secretary of state a whopping 12-point lead on Trump in a head-to-head matchup. A popular vote with results in that range would lead to an electoral landslide, too: according to a Frontloading HQ analysis, released Monday, Clinton destroys Trump in the electoral college, 358 to 180. Last week, an ABC poll showed her winning the national map with 262 to 191, assuming Trump takes all the Republican-leaning states. Another huge advantage Clinton and Democrats possess is the mathematics of the electoral college. Usually Republicans have the advantage in midterm elections because they are likely to achieve a stronger turnout than Democrats, while Democrats have the advantage in presidential elections because their turnout will be higher and, even more, because the state-by-state breakdown of electoral college math gives Democrats the edge. Anything is possible in presidential politics, but things are shaping up to produce a Democratic landslide for Hillary Clinton similar to the landslide of Lyndon Johnson over Barry Goldwater in 1964. 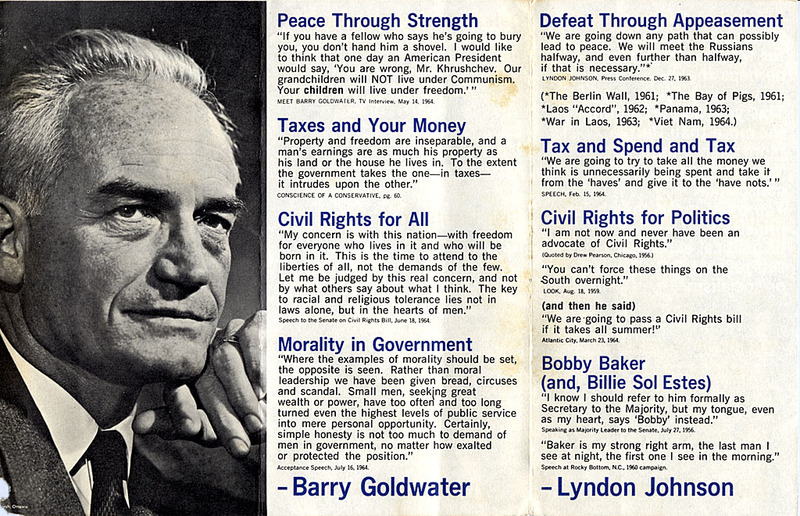 The following article attempts to make the case that the mass exodus from the Republican Party in the late 60’s due to Goldwater’s anti Civil Rights stance was counterproductive. That somehow, the Civil Rights Act of 1964 failed because while it made the legal structure of Jim Crow in America…It didn’t go far enough in eliminating the structure of White Privilege which remained. Never mind that it was the Republicans, led by Goldwater who gutted the legal and criminal enforcement section of Title IV of the Civil Rights Act leveling criminal and civil sanctions against violators, and protecting the continuation of discrimination to this day. I mean, what if the folks who constructed the predatory mortgage loan were looking at 5-10 years in Gen pop, instead of a financial slap on the wrist during the 2006 meltdown? 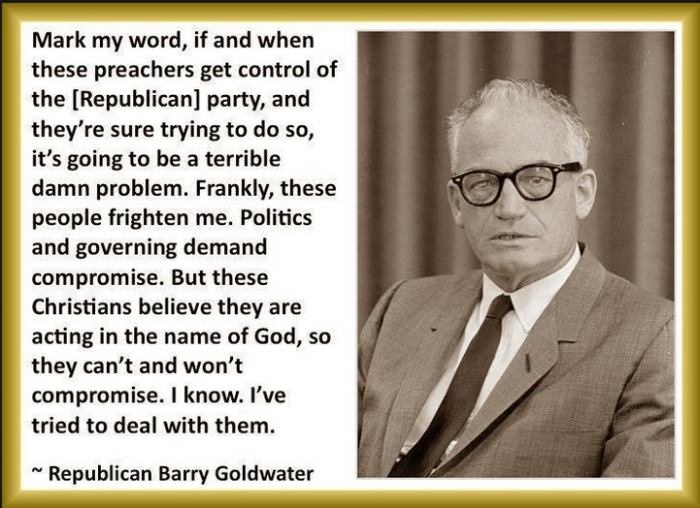 The simple fact is, since Goldwater it has always been a “conservative principle” to protect the racists, and the institutions which benefit them. Things like propping up the racist Southern Myth that the Civil War wasn’t necessary because the kindly slave owners would have freed the slaves. The reason that now, near 97% of black voters support Democrats is really simple…Nixon, Reagan, and Bush. It’s a perverse argument, made in one form or another by the right, and has the logic of the Jews joining the Nazi Party in 1930’s Germany, because eventually Hitler would have seen the light. The other fiction presented by the author is that Jim Crow only lived in the South. That isn’t quite true. Days before the 1960 election, Coretta Scott King received a call from then-candidate John F. Kennedy while her husband was in a Georgia jail, charged with trespassing after leading a sit-in demonstration against segregation in Atlanta. “This must be pretty hard on you, and I want to let you both know that I’m thinking about you and will do all I can to help,” Kennedy told her. The Democratic nominee’s brother and campaign manager, Robert Kennedy, called a DeKalb County Judge and successfully lobbied for Martin Luther King Jr.’s release. The personal call and the timely intervention significantly bolstered Kennedy’s standing among black voters. They also strengthened the political alliance between the Democratic Party and African Americans. After his release, King praised Kennedy for exhibiting “moral courage of a high order.” His father, the influential Baptist pastor Martin Luther King Sr., said, “Kennedy can be my president, Catholic or whatever he is. I’ve got all my votes and I’ve got a suitcase and I’m going to take them up there and dump them in his lap.” Kennedy earned 68 percent of the black vote, which was the decisive factor in key states like Illinois, Michigan, and South Carolina. Once in the White House, Kennedy faced pressure from civil-rights activists to make good on what King called a “huge promissory note” to pass meaningful civil-rights legislation. When President Lyndon B. Johnson signed the Civil Rights Act of 1964 and the Voting Rights Act of 1965, he cemented a political alliance between African Americans and the Democratic Party that continues to this day. But celebrating these landmark pieces of legislation makes it easy to overlook what black people in the United States lost when civil rights and equality for blacks were hitched to the Democratic Party. While the passage of the Civil Rights Act helped Johnson earn support from 94 percent of black voters in 1964, there is a gulf between what black Americans hoped the legislation would achieve and what Democratic politicians actually delivered. 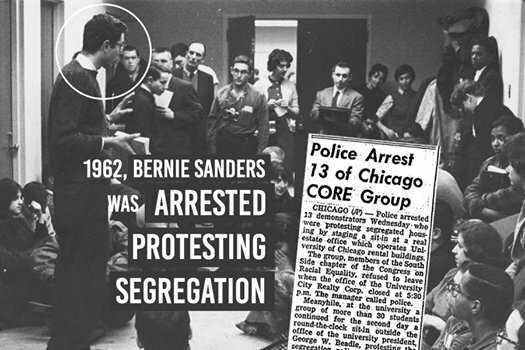 Although the Civil Rights Act of 1964 helped end apartheid conditions in the South, a critical objective for which grassroots black Southern activists fought and died, the legislation did little to address the structures of racism that shaped black lives in cities like Chicago, Los Angeles, and Philadelphia. This was an intentional consequence of how the bill’s sponsors, largely liberals from the North, Midwest, and West, crafted the legislation. After the 1964 election, where Republican candidate Barry Goldwater described the Civil Rights Act as unconstitutional, black voters essentially found themselves in a one-party system for presidential elections. Republicans turned their attention to white voters in the South and suburbs and have made few serious attempts in subsequent campaigns to appeal to the African American electorate. Richard Nixon in 1960 is the last Republican candidate to earn more than 15 percent of black votes. This is a problem for black voters, because the Democratic Party’s vision of racial justice is also extremely limited. Northern liberals pioneered what scholars now call “colorblind racism.” That’s when racially neutral language makes extreme racial inequalities appear to be the natural outcome of innocent private choices or free-market forces rather than intentional public policies like housing covenants, federal mortgage redlining, public housing segregation, and school zoning. 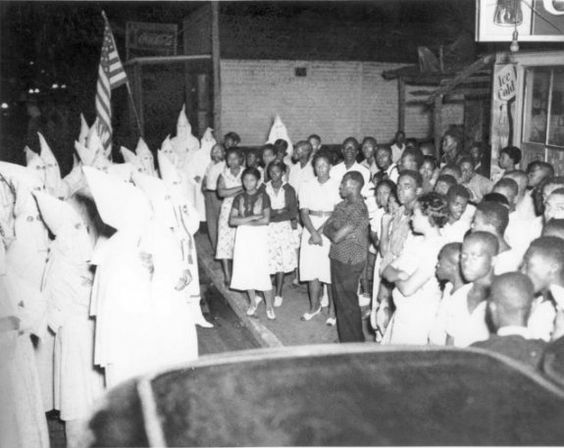 Democratic lawmakers drafted civil-rights legislation that would challenge Jim Crow laws in the South while leaving de facto segregation in the North intact. When NBC News asked the civil-rights organizer Bayard Rustin why many African American communities rioted the summer after the bill passed, he said, “People have to understand that although the civil-rights bill was good and something for which I worked arduously, there was nothing in it that had any effect whatsoever on the three major problems Negroes face in the North: housing, jobs, and integrated schools…the civil-rights bill, because of this failure, has caused an even deeper frustration in the North.” Today’s protest movements against second-class citizenship in Baltimore, Ferguson, Oakland, and elsewhere are in part a legacy of the unresolved failures of civil-rights legislation.